A one-hour session with an experienced archery instructor. Full tuition will be given on the art of using a recurve longbow (a normal bow and arrow!) Each instructor can look after up to eight people during an hour session. Each participant will be taught how to hold a bow, aim and shoot at a full size archery target using Carbon shafted arrows. Archery Participants will shoot a series of practice arrows which will allow the basics to be mastered before the session moves on to a competition round (usually 9 arrows per person). Throughout the duration of the event most participants will see a real improvement in their accuracy and ability. 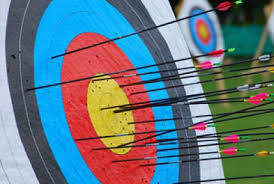 Most people begin with no experience and can only just get an arrow on target – by the end of the session some impressive scores can be achieved.